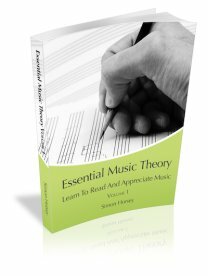 Learn piano or learn keyboard are my top tips for anyone wanting to improve their understanding of music theory. Knowing the layout of the piano keyboard is so helpful when it comes to so many aspects of music theory including intervals, chords, scales, harmony, modulation...the list is endless. Having just a basic knowledge of the layout of the piano keyboard and where the notes are is a huge help to start with and being able to play some basic keyboard will help as well. I'm not necessarily advocating you learn piano with a specialist teacher, just that you know enough about the layout of the piano keyboard to help you and you are able to play enough on the keyboard to form basic chords and scales. Of course, you don't need to learn piano in a formal way just to learn the position of the notes on the keyboard...you can do that right here! The piano keyboard has white notes and black notes. The white notes are next to each other and the black notes are divided into groups of two and three which alternate up the keyboard. Here is a picture of the piano keyboard. We use the grouping of the black notes to help identify the white notes. The first white note to learn is C. Many people know how to find C on a piano, whether they learn piano or not! C is found directly to the left of any group of 2 black notes. There are 2 Cs marked on the keyboard diagram below. The next note to learn is F.
F is found directly to the left of a group of 3 black notes. F is marked on the keyboard diagram below. There is only one F marked, but you can pick out more Fs on the 1st picture of the piano keyboard. Each note that is directly to the left of a group of 3 black notes is an F.
The next notes to learn are those on the right of the group of w and the group of 3.
but then A follows G.
This is because the musical alphabet only has 7 letters (A, B, C, D, E, F, G) so once you arrive at G you begin on A once more. Fortunately this is easy to remember because A is followed by B...just like the alphabet! If you want to actually learn piano you have 3 options. Use the Rocket Piano course which is the only online piano course I feel able to recommend...although there is no substitute for getting a good one-to-one teacher. However, if cost is an implication Rocket Piano is less than an entire semester of lessons for an entire beginner-to-advanced piano course!